It's time for the Oscars! I will be traveling to a wedding in Arizona, so won't be hosting any sort of Oscar shindig this year, but I couldn't resist sharing some great stuff on throwing an Oscars party from Every Day with Rachael Ray. The good thing is that this list of recipes is intended for a last minute party, so you're not out of time yet! There are recipes for Smoked Salmon Pizza, Herb Sliders, Spicy Marinated Olives, Golden Lemon Orange Bars, and Starlet Cocktails. If you scroll down a little, you'll also see suggestions for a table setting. And, highest on the cute scale is a printable ballot so you and your guests can play along. Cate at Sweetnicks made it back in to her kitchen and tried Rachael Ray's Chocolate Pots de Creme. Kristen Doyle at Paper Palate discusses her discovery of 365: No Repeats and points out a few of her favorite recipes from it. The gossip pages of the Boston Globe inform us that Rachael missed a performance of her husband's band due to a missed flight, but checked in with Gretchen Monahan throughout the show. Jamie at It's a Jamie Thing points out some centerpieces from Every Day with Rachael Ray that would be perfect for home or other event. Miami's CBS4 discusses the South Beach Food and Wine Festival's Burger Bash, which will be hosted by Rachael. 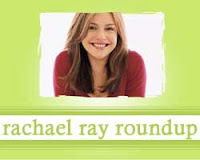 Patti Martin of the Asbury Park Press highlights a great Rachael Ray recipe for kids. Deborah at Taste and Tell made a pan sauce from Every Day with Rachael Ray. Aww...thank you so much for the sweet mention! :) I love your blog, and have decided to add it to my blogroll. Thanks again, have a great weekend! My pleasure, Jaime! Thanks for writing a great post.